Throughout the year Buckingham Town Council arranges a number of exciting events such as the Fringe Week, River Rinses, Bonfire and Fireworks and the Christmas Light Switch-On. These events are attended by and enjoyed by thousands of local people. To make these events even better, The Buckingham Town Council are looking to work with local businesses who are looking to raise their local profile. The new sponsorship pack has options to suit businesses of all sizes and sectors. The Council are also open to discussion and very keen to explore new ideas. 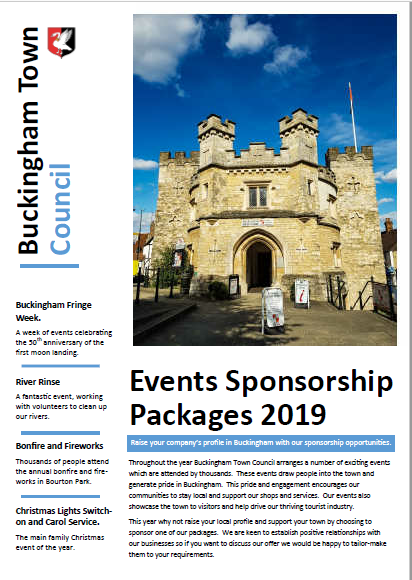 To receive a copy of the sponsorship pack or to discuss our sponsorship opportunities contact the Deputy Town Clerk, Claire Molyneux, at deputytownclerk@buckingham-tc.gov.uk or go to our events page.